The Institute of Ukrainian History of the National Academy of Sciences of Ukraine and the Institute of Historical Studies of the Bulgarian Academy of Sciences are parties to the signed agreement. Besides interaction of these institutions themselves, it seeks to strengthen Ukrainian-Bulgarian ties in the areas of science, education, and culture. First of all, it deals with the need to create a commission of Bulgarian and Ukrainian historians, which should be composed of leading scholars from both academies, well-known students of Bulgarian and Ukrainian issues, and follow the example set by the Ukrainian-Polish body. Unlike the latter, it is unlikely that the future commission will have to consider diametrically opposite views on past events (such differences just do not exist in this case). At the same time, such a commission can become the basis for new contacts. Developing them, holding scholarly exchanges and bilateral consultations, as well as joint conferences, seminars, summer schools, roundtables, and documentary exhibitions – all this forms the next priority set out by the parties. Likely directions of cooperation currently include advising postgraduate students of the other party as they write their theses, joint publishing projects, exchanging research literature, and submitting articles to the other party’s publications. The above list is not exhaustive. Tentative topics of research projects include: various aspects of Ukrainian-Bulgarian relations, the Ukrainian historiography of Bulgaria and Bulgarian historiography of Ukraine, research sources available in both countries, the history of Bulgarian settlements in Ukraine and Ukrainian ones in Bulgaria, Ukrainian-Bulgarian relations within the international system, and prominent figures of the shared history. The signing of the agreement became possible due to the History of Diplomacy and International Relations Scholarly Society initiating the conference “Bulgaria and Ukraine in the History of Europe,” which was held in the Bulgarian capital. Supported by the Ministry of Foreign Affairs of Ukraine, the Embassy of Ukraine in Bulgaria, and other partners, it became an exceptional phenomenon, as Sofia had never seen 20 Ukrainian historians visiting at the same time. As noted at the opening, the names of Ivan Shishmanov and Mykhailo Drahomanov are equally close to the hearts of Ukrainians and Bulgarians. In recent years, Ukrainian-Bulgarian relations have been developing rapidly, increasing the mutual interest of the two peoples in each other. The book My Sister Sofia..., which appeared in Den’s Library series two years ago, is a manifestation of this interest, and at the same time a notable factor in its continued development. The conference focused on the events that occurred a century ago and their long-term effects on the 20th century. The scholars stressed that it was incorrect to say that the Ukrainian-Bulgarian intergovernmental relations were 26 years old, since they had actually turned 100, starting with the signing of the Treaty of Brest-Litovsk by the Ukrainian People’s Republic and the Central Powers alliance, which included Bulgaria. As Bulgarian scholar Professor Petar Stoyanovich asserted, it was a just peace for his country, a thin streak of triumph ahead of the coming crushing defeat. By the way, the Bulgarian scholar is a direct descendant of Minister Plenipotentiary Ivan Stoyanovich, who was one of the main negotiators in Brest-Litovsk. The unique role of the Treaty of Brest-Litovsk for Ukraine was emphasized by Ukrainian historian Professor Iryna Matiash, who said it offered a basis for Ukraine’s entry into the international arena, its effective legitimization. In her opinion, all parties involved perfectly understood others’ objectives and deliberately agreed to this step to pursue their national interests. Existing disagreements led to problems with ratification afterwards. However, it did not apply to Bulgaria and Ukraine, as they quickly exchanged ratification instruments. When it came to the appointment of ambassadors, Tsar Ferdinand insisted that the Ukrainian side be represented by a well-known national figure. In the end, Oleksandr Shulhyn got that job on the advice of Bulgarian Ambassador Shishmanov (a student of Taras Shevchenko’s works and the husband of Drahomanov’s daughter Lidia). Especially striking was the spectacular conclusion of Shishmanov’s speech during the presentation of his credentials to Pavlo Skoropadsky, namely his words: “Glory to Ukraine! Glory to the Illustrious Lord Hetman!” That is, the Bulgarian was, at the very least, very well acquainted with the situation in Ukraine, so much that he could take credit for the most famous Ukrainian slogan. Bulgarian scientist Blagovest Nyagulov stressed that the leadership of the Tsardom of Bulgaria was genuinely interested in the emergence of an independent Ukraine, for it offered Bulgaria a chance to raise the issue of the status of Dobrogea and some other areas in the context of the negotiations in Brest-Litovsk. Indeed, young Ukrainian diplomats found a common language with their Bulgarian counterparts very quickly. The latter became a sort of intermediaries between the various involved parties. One of the negotiators, Minister Plenipotentiary General Petar Ganchev, was convinced that the peace with Ukraine was much more important than the peace with Bolshevik Russia. Another Bulgarian researcher, Volodya Milachkov, reported on the serious attention of the Bulgarian media to the Ukrainian issue at that time. According to available information, the drafting and signing of the Treaty of Brest-Litovsk increased the number of such reports manifold. In addition to that topic, the Bulgarians were interested in Skoropadsky’s rise to power, the relationship between Ukraine and Russia, the Romanian intervention in Bessarabia, the relations of Ukrainians with ethnic minorities (primarily Bulgarians), the land issue, transportation, and currency exchange rates. A separate topic was the reception of Bulgarian Ambassador Shishmanov in Kyiv and his Ukrainian counterpart Shulhyn in Sofia. When accepting the credentials of the latter, the head of the Bulgarian state emphasized: “We know where the soldiers who died for Bulgaria’s freedom came from.” This is not surprising, given the fruitful activities of Ukrainians in Sofia. Director of the Institute for History Studies Daniel Vachkov covered in his presentation a little-known page of the history of the First World War. There was a circle of intellectuals in Bulgaria who believed that to prevent future wars in Europe, it was necessary to create a federation. Moreover, that process had to unfold in spatially and temporally distinct stages. One such stage was to involve the nations of the Balkans, the Carpathians, Asia Minor, the Caucasus, and the northern seaboard of the Black Sea. That is, Ukraine was to have a role in it as well. Next, they envisaged the Teutonic and Scandinavian federations. In the end, these entities had to unite in a pan-European one. However, the Versailles system laid a completely different foundation. Only after the horrors of the Second World War did Europe return to the idea of unification. The conference dealt with contemporary issues as well. I mean, in particular, the rapid growth of bilateral trade, a significant number of cultural and artistic events, and mutual sympathies among citizens. By the way, as it turned out, Bulgaria, unlike Hungary, does not consider the new Law of Ukraine ‘On Education’ to be discriminatory. On the contrary, it emphasizes that the law opens up new opportunities for studying the Bulgarian language. Bulgaria supports the sanctions policy imposed by the EU in connection with Russia’s aggression against Ukraine. However, this position is more clearly defined at the presidential level. The cabinet, meanwhile, is more cautious, and it insists that the sanctions should be observed as an expression of pan-European solidarity. The conference heard alarming data of opinion polls, showing that 35 percent of the polled Bulgarians approved the annexation of Crimea by Russia, 27 percent were against it, and another 38 percent had no answer. In general, the pro-Russian attitude prevalence is estimated at 61 percent. According to the speakers’ observations, the events of recent years have led, helped by the influence of Russian propaganda, to an increase in pro-Russian attitudes in Bulgaria. At the same time, they made Ukraine more recognizable among the Bulgarians. The conference was held on a parity basis, and both Ukrainian and Bulgarian scholars spoke there, but this author considered it advisable to highlight the Bulgarian side as less-known in Ukraine. The gathering of historians has shown a desire to expand, diversify, and intensify contacts. This is all the more important given the opinion poll data provided there. 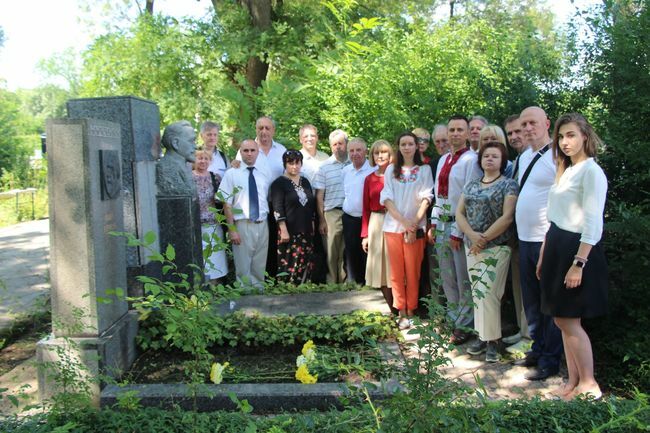 For now, after the official closure of the scholarly forum, Ukrainian historians visited the grave of Drahomanov – an individual who is equally appreciated by Ukrainians and Bulgarians. He succeeded in significantly affecting the perception of Ukraine in Bulgaria in his age. It is time for us to act now.